Here is another one of our Felt Doll Statues. This is Our Lady of Mt. Carmel. She turned out so nice! 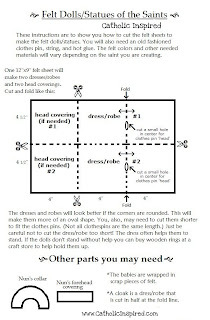 Again this project requires the use of hot glue, so if you plan to make these with small children they will need help. Older children may be able to do these on their own if they are accustomed to using hot glue. 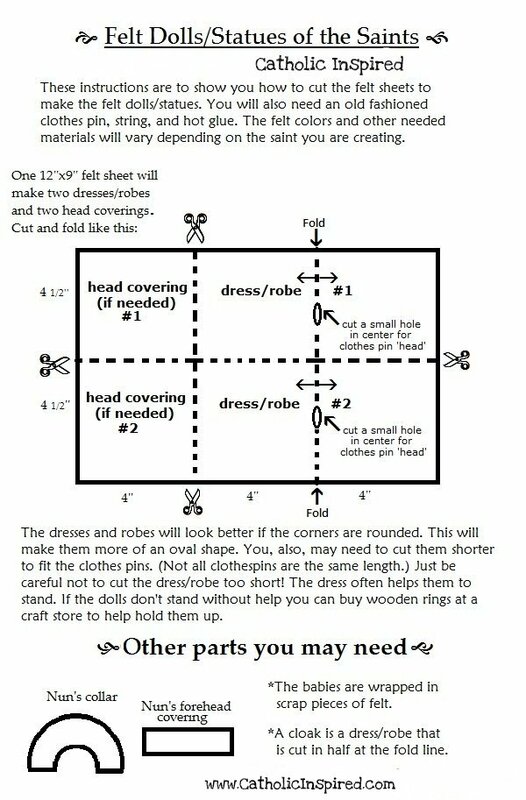 After cutting out your felt pieces, (as directed in the cutting instructions above) slip the round clothes pin head into the hole of your dress. You may need to add a drop of hot glue at the upper chest and upper back of the doll clothespin to keep the dress from sliding down the clothespin. Pull all the dress parts down against the clothes pin and tightly knot a string around its waist. You may need an extra hand to hold the dress down while you knot the waist string. Now, cut off the extra sting ends. If the dress is too long, cut it to the correct length. If the opening on the sides of the dress are showing, hot glue it together. Now, wrap the collar around the neck and hot glue it in place. Make sure the collar's opening/seam is in the back. Take your cloak and fold the corners in. Be sure to test it to see if the neck size and the length is correct for your doll. When the size is correct, hot glue the corners down, (see pic above) and hot glue the cloak to the doll's neck, leaving the front of the dolls neck uncovered. Be sure the folded corners are inside against the dolls dress. Add hot glue to the top and sides of the dolls head and cover the top of its head with the WHITE (NOT black, as pictured) felt habit. Note: You may have to cut a slit in the back of the habit, (from the bottom of the habit up to the head) so it will lay down properly. Then hot glue the back of the habit together so you don't see the cut. If the doll has a hard time standing on its own you may need to buy a wooden ring to help it stand. If you can't find wooden rings, you may be able to hot glue the doll to a small wooden flat shape. Cut or break the bottom of the mini clothes pin off so it is the correct size. OR if you don't have a mini old fashioned clothespin you can use a craft stick. Break the craft stick in half and hot glue them one on top of the other. Now add some hot glue to the top and side of the baby's head wrap the edge of the felt piece around the top of the baby's head. Then wrap the rest of the felt around the baby, covering it completely. Hot glue the blanket in place. Then hot glue it to the doll of Mary.﻿ If possible, try to use the cloak as an arm so it can look like she is holding the baby. Now make four brown squares and two smaller white squares to make the mini scapular. Glue the string between the two brown squares and add the two white squares to the front. Now, glue the Scapular to the other "arm" of Mary's cloak. Finally add her crown. Use a small piece of gold ribbon to make a circle. Hot glue the ends together and hot glue the gold ring to Mary's head. I hope I explained this well enough, If you have any questions please post a comment and I will respond. I hope you enjoy making this little doll/statue as much as we did!! I love this because I used to make clothespin dolls when I was little. This is simple and yet so great as a reminder of our faith. Our Lady of Mt. Carmel pray for us! Thank you, Monica! I imagine you had lots of fun with those dolls! My girls sure like these! God Bless! oh I love this!!! I am from a town called Mt carmel and one of my very dear friends daughters is entering a Mt carmel convent tonight!!!!! Oh, that's wonderful!!! What a blessing!!! May God bless you all!